Picture of a Guitar phím lõm, an instrument derived from a guitar with the neck scooped out between the frets to give the musician more options for bending the pitch. The đàn lục huyền cầm (literally "lute with six strings"), or colloquially đàn ghi-ta phím lõm (literally ghi-ta "guitar", + phím "fret", + lõm "sunken"), is a scalloped Vietnamese adaptation of the French guitar. 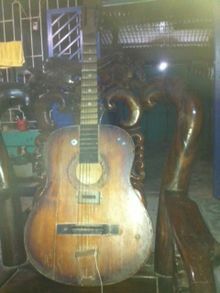 The guitar, or ghi-ta, was adopted by Vietnamese musicians during the 19th Century. However, in order to adapt a western guitar to the deep pressing on the strings necessary for Vietnamese music the fingerboard - the wood of the neck between the frets - was scooped out to ease the pressing. This carving out of the fingerboard is what gives the distinctive scalloped appearance to the six-string đàn lục huyền cầm. This form of guitar is commonly used in cải lương or "Southern Reformed Theater." Page with pictures of the scooped out neck. Text in Vietnamese. ^ Adelaida Reyes Songs of the Caged, Songs of the Free: Music and the Vietnamese Refugee Experience 1999 Page 186 "This "doctoring" involves carving the fingerboard deeper between the frets, making the fingerboard look scalloped. ... Also called lục huyền cầm (literally, guitar; see Jones-Bamman 1991:73-75) or Vietnamese guitar, the instrument has six strings." ^ The Garland handbook of Southeast Asian music - Page 262 Terry E. Miller, Sean Williams - 2008 "Lục huyền cầm "six-stringed instrument" and dan ghi-ta are Vietnamese terms for the Western guitar, used in traditional ..."
^ "Cải lương is also called Southern Reformed Theater (Nguyen and Campbell 1990:28; Pham Duy 1975:112)"
^ Popular Musics of the Non-Western World: An Introductory Survey Page 200 Peter Manuel - 1990 "Most of the music used in cải lương consists of pieces in purely Vietnamese style. ... One imported instrument that has become virtually ubiquitous is the Western guitar, preferably electric, with steel strings. ... intervals and fast vibrato essential to the style, the spaces between the frets are scalloped out to form concavities." ^ Simon Broughton, Mark Ellingham, Richard Trillo World Music: Latin and North America, Caribbean, India, Asia and Pacific The Rough Guide - Volume 2 - Page 265 2000 "Because of the anti-religious stance of the Vietnamese government until 1986, the style was practised in secret, though some pieces were adapted for inclusion in state-sponsored cheo theatre." "... the đàn lục huyền cầm, a regular guitar with a fingerboard scalloped to allow for wider pitch bends." This page was last edited on 20 June 2018, at 01:51 (UTC).